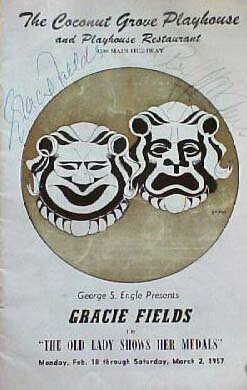 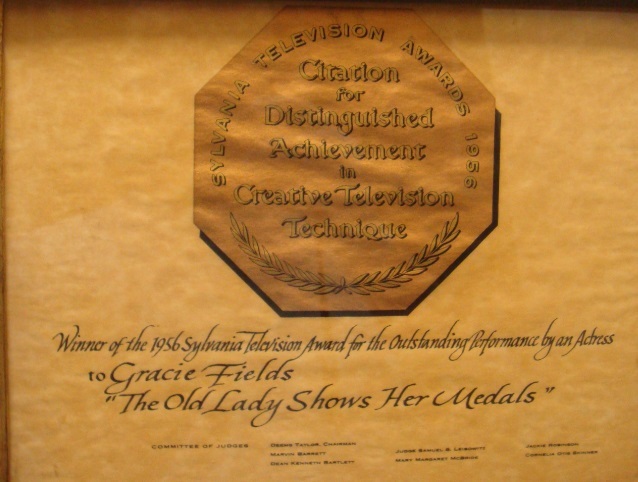 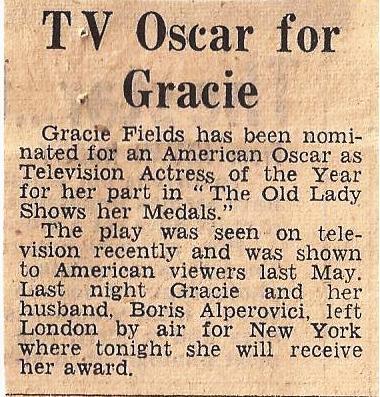 Broadcast live on American TV in the ‘Goodyear Television Playhouse’ series by the ‘United States Steel Hour’ on April 23rd 1956, Gracie appeared in a screen adaptation of the J.M. 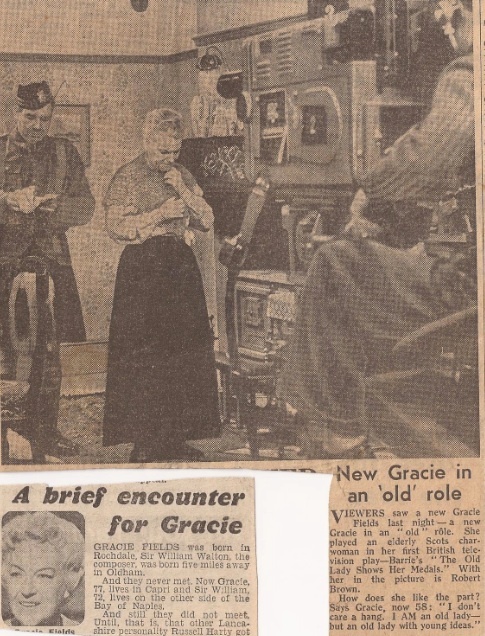 Barrie play ‘The Old Lady Shows Her Medals.‘ She plays char-lady Sarah Dowey, who tries to persuade her friends that, like them, she too has a son in the Great War, (played by Jackie Cooper). 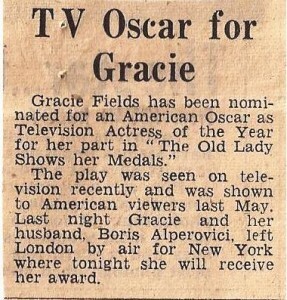 Her performance saw her receive an EMMY nomination for ‘Best Single Performance by an Actress.’ Whilst filmed live in New York, (with a copy now known to exist of the original broadcast), the production was redone on December 19th 1956, and it appears that this production was re-aired on June 18th 1963. 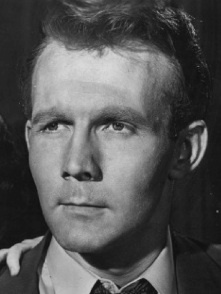 (Biff McGuire took over the role as Gracie’s son in this version). She was awarded a Sylvana TV Award for this portrayal. 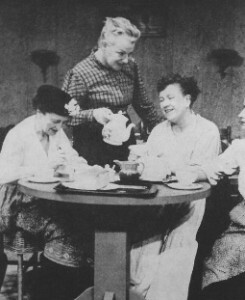 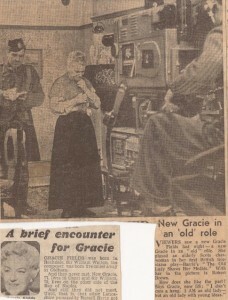 Picking up on the popularity of the play in England, British audiences got to see Gracie perform the role on 4th November 1956, when ITV remade the play with Gracie and a new cast. 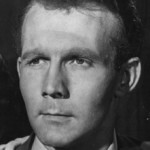 An off-air recording is all that is known to exist of the British production, with cast-details unknown, except for Robert Brown and Doris Speed, (of later Coronation Street fame).